Laugfs Group has posted a revenue of Rs 5.32 billion which is 32 percent increase over the corresponding year for the nine months ended in December 31. The Profit After Tax (PAT) of the group was Rs 750.3 million which is an impressive 96 percent increase over the same period last year. The market saw a turnaround yesterday with the Colombo Stock Exchange (CSE) All Share Price Index (ASPI) exceeded the 7,000 milestone for the first time this year. The ASPI closed at 7,014.85 points moving up by 22.15 points, while Milanka Price Index (MPI) closed at 7,327.22 points gaining by 12.51 points yesterday. Many foreign investors have shown interest to invest in the 400-acre land to be reclaimed in the Galle Face area using extracted soil from the sea. The land is to be used to build commercial buildings, luxury hotels and other high rise buildings. 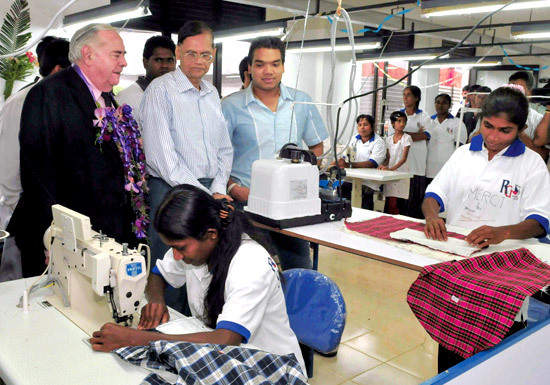 Namal Rajapaksa MP opened the Rangiri Garment Factory in Rangiri, Hambantota built with funds from the French Government on Tuesday. External Affairs Minister Prof G L Peiris and representatives of the French Government participated the ceremony on the invitation of MP Rajapaksa.